Read the text carefully and retell the text using the following plan. Nbsp; 1. Match the words with their definitions: 1) cargo (n.) ['kɑːgəu] a) the flat part of a tool, weapon, or machine (such as a fan) that normally has a cutting edge and/or pointed end 2) pump (n.) [pʌmp] b) capable of working successfully; feasible 3) blade (n.) [bleɪd] c) occurring at irregular intervals; not continuous or steady 4) nacelle (n.) [nə'sel ], [næ'sel] d) having or involving a sensation of spinning around and losing one's balance 5) prairie (n.) ['prɛərɪ] e) likely or liable to suffer from, do, or experience something unpleasant or regrettable 6) viable (adj.) ['vaɪəbl] f) a thing that is very ugly, esp. a building that disfigures a landscape 7) prone to/to do something) (adj.) [prəun] g) goods carried on a ship, aircraft, or motor vehicle 8) intermittent [ˌɪntə'mɪt(ə)nt] h) a large open area of grassland, especially in North America 9) eyesore (n.) ['aɪsɔː] i) a mechanical device using suction or pressure to raise or move liquids, compress gases, or force air into inflatable objects such as tyres 10) dizzy (adj.) ['dɪzɪ] j) a streamlined housing or tank for something on the outside of an aircraft or motor vehicle 1. Wind power is one of the fastest growing forms of alternative energy in the world. More and more, wind power mills are seen in the countryside, in large wind farms and for the most part, away from city life. But a new form of wind power is now designed to work in an urban environment. Watch the clip ‘New wind turbine design’ and then discuss with your partner if the new design is a really good one. 2. Now watch and listen again and note the advantages of the new form of wind power. 1. You are going to read an article about wind power. Discuss with your partner the following questions. 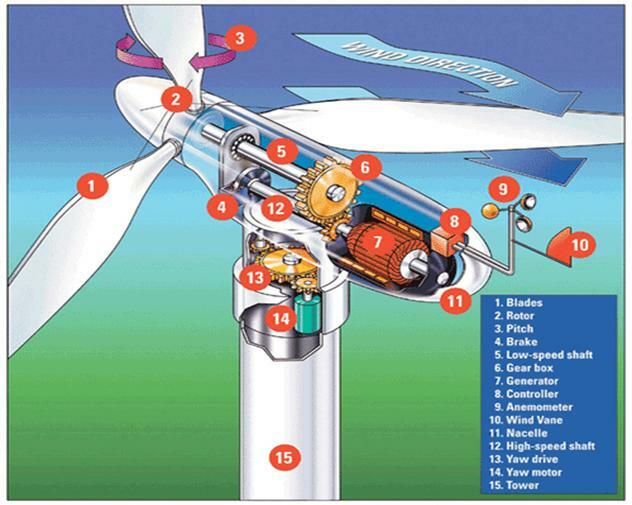 · What do you know about the wind power? · Why do we need it? Skim the text to check your ideas. Throughout history the wind has been used by humans as an energy source for such things as transportation and food production. Energy released by the trade winds—winds that almost always blow in the same direction—was first captured in the sails of ships and used to transport the ship and its cargo across oceans. There are few large ships that still use wind power, although many people continue to enjoy sailing smaller crafts using the power of wind. Food production, such as grinding flour for baking bread, was sometimes powered by wind-driven windmills. Those windmills were eventually modified to run water pumps and even later, to generate electricity. Today, the modern windmill, called a wind turbine, is used to generate large quantities of electricity. Through advances in technology, energy producers can even generate electricity from a whole series of wind turbines, called a wind farm. These wind farms are beginning to spread through the whole world. For centuries farmers have used windmills to harness the wind to grind grain into flour for baking. Windmills were known to be in use in Europe as long ago as the twelfth century. In more recent history, the windmill was adapted for pumping water to irrigate fields, to provide drinking water, or to run small sawmills. A classic windmill has a fairly simple design with several blades on a rotor that turns on top of a tower as the wind blows through them. Blades may be constructed of various materials, including wood, cloth, and metal. They generally have a large surface to capture as much wind power as possible. The tower they sit atop can also be quite tall, sometimes up to fifty feet, as the wind tends to be stronger higher above the ground. As the wind blows, it turns the blades of the windmill, which spin a central shaft (or pole) that extends from the top to the bottom of the tower of the windmill. The spinning shaft may be attached to many different mechanisms at the base of the windmill, depending upon the windmill’s use. If a farmer wishes to grind grain, the spinning shaft is attached to a gear that turns a grain mill; if the farmer wants to pump water into the fields, the shaft is designed to drive a pump. Wind turbines work much like windmills, but they are used specifically to generate electricity. A wind turbine usually has fewer blades and is made of lighter materials, such as plastics, which allow the blades to turn more quickly and with less wind. The blades of the wind turbine capture the energy of the wind and send it down a shaft inside the nacelle. This shaft spins the turbines of a generator. Inside the generator is a large pole with metal wires wrapped around it. On the inside walls of the generator are magnets. As the turbine poles spin, the magnets draw electrons from the wire and produce electricity. A wind turbine can produce enough electricity to satisfy the needs of a home. In some cases, a single turbine may also produce excess energy that can be stored in batteries or sold to a local utility company. Wind turbines can also be grouped together to create large quantities of electricity. This is referred to as a wind farm. Wind farms are becoming more widespread throughout the world. In Denmark, for example, 10 percent of its power needs are met with wind farms. Denmark has also created laws that allow wind machine owners to easily sell their excess electricity to local utility companies. Often, individual families in Denmark will buy several large wind machines that produce enough electricity to power the homes of fifty to seventy-five families. Since the Danish government fully supports this form of green energy, the use of wind power is expected to keep increasing in their country. The number of wind machines is expected to increase even more as several developing countries, such as Argentina, Pakistan, and some African countries, are exploring the use of wind farms as they establish their own energy infrastructures. Like solar power, wind power is a renewable energy source. The energy of the sun drives the production of wind. Since the sun is in daily supply, the energy required to create wind is continuously available. Unlike solar power, however, the energy of wind is also present during the nighttime as land and water absorb the heat of the sun. Wind power can also be available in great supply. Strong and consistent winds tend to occur where there are large areas of flat land, such as prairies and deserts that are heated by sunlight. The desert sands trap the heat of the sun and slowly release the energy throughout the troposphere during the night. Wind power can be an easily viable source of energy for many people, but there are some drawbacks. Perhaps the biggest drawback to wind power is that a person must live in a windy area to harness it. These areas tend to be rather flat or desert like and do not often attract many people. In addition, few people tend to use standalone systems in these areas, as more traditional sources of electricity are already available. These areas can still be used to build wind farms, however, as the electricity produced can be connected to the grid. Even when living in a windy area, the wind cannot be counted on to always be blowing. Some days are windier than others and some seasons are prone to higher winds than others. With such an intermittent source of power, the electricity produced by wind turbines often requires battery storage. These batteries generally have a long life span of about ten to twenty years, but eventually require replacement. As with solar power systems that use batteries to store energy, battery disposal is an issue as the materials used to create batteries are toxic to the environment. Some people prefer to use gasoline-powered generators as a secondary source of power on the days when there is little wind. These generators usually burn fossil fuels. The burning of fossil fuels contributes to air pollution. It also emits greenhouse gases, which are damaging to the atmosphere. Wind machines can also cause noise pollution. The whirling of the blades and the spinning of the turbine in a ten-kilowatt wind machine positioned three hundred feet from a home produces noise that is comparable to wind blowing through trees. Many people find this noise to be an irritant and consider it noise pollution. For some people wind machines are a pleasing sight. The straight lines against a blue sky make a beautiful view. For others wind machines and wind farms are an eyesore. They disrupt the view and break up the natural landscape. The blades are dizzying, the towers block the sun, and their bases are large blocks of unattractive cement. Wind machines can also have an environmental impact on wildlife. They are considered something of a hazard to migratory birds. The birds fly into the blades and are killed. For this reason, scientists are studying the flight patterns of migratory birds more thoroughly, and wind farmers are trying not to build in migratory birds’ flight paths. Researches also think about painting the blades with different colours. Some of the specifics of the investigations include redesigning the shape of the blades and the materials they are made of, improving the internal mechanisms, and exploring optimum locations for the machines. 2) Wind turbines: the modern windmill. ǃ To talk about situations which are changing or developing around present, ether at this precise moment, or something which is in progress around the present, but not necessarily at the moment of speaking, we use the Present Progressive Tense (subject + am/is/are + verb-ing + object). These wind farms are beginning to spread through the whole world. 1. Find and underline other examples in the text and name the situation.